Dark brownish grey with lighter striped markings on legs. Females are typically 3/8 to 1 3/8″ in length, while male wolf spiders are about 1/4 to 3/4″ long. They tend to be big and hairy, which alarms people, but they are just considered a nuisance, not a harmful spider. Wolf spiders hunt during the night and rest in sheltered spots during the day. They’re commonly seen by people, too because they’re fast runners. They’ll only bite when provoked or handled. People react differently to insect bites, so it’s important to seek medical attention if you are concerned about an insect bite. Like most other spiders, the wolf spider preys on other insects. They don’t capture their prey in webs though. The wolf spider is super fast and prefers to run after its prey and capture them with their long legs. 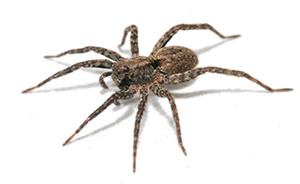 Controlling other insect populations inside your home will reduce the attraction of wolf spiders to the interior structure of your home or business. Generally, the wolf spider prefers to live outdoors and will only remain inside if the food source is promising. A professional application to the perimeter of the exterior structure will prevent insects from gaining access indoor as well.